When you first notice your garage door has stopped working properly, consider a few of the most common issues that could be causing it. Keep in mind that you may need professional assistance anyway, as these systems can be extremely dangerous to handle without the proper training. This may seem like a bit of an obvious one, and will likely be the first thing you instinctively check when you first realize your door isn't responding. Still, you'd be surprised to learn how remarkably common it is for people to forget to simply check their batteries. Try using brand new ones as well as making sure they are slotted into the remote the right way. If this solves the problem, count your blessings and don't berate yourself for forgetting to replace them in time. The photo-electric eyes inside your door need to be perfectly aligned in order to work correctly. If they've been bumped out of position or if their lenses have become dirty, the system will not function properly, and your door will not be safe to use. Do not try to realign them by yourself. These components are very delicate and need to be adjusted by precise professionals. If your garage door runs along a metal track, over time this sensitive pathway can be filled with dirt, leaves or can become damaged. This will affect the stable movement of your door, and could potentially make it slide off, which can be extremely dangerous. 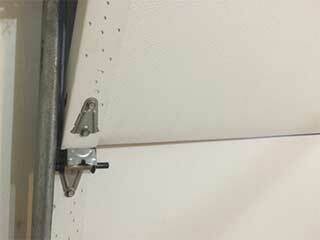 One of the most common things that can happen to garage doors is that one or more of their springs will break. These crucial components are the ones responsible for doing all of the "heavy lifting" while your system is operating, and are therefore under a great deal of tension on a daily basis. When they snap, they do more than render your door inoperable. They make it potentially very dangerous to operate, even manually. It's highly inadvisable for you to try and repair or replace these components by yourself. Garage door springs should only be handled by trained professionals, as they can lead to laceration and/or property damage, not to mention, the redistribution of tension after one of them breaks makes the entire door liable to suddenly collapse altogether. Regardless of how minor a problem may seem, it's always better to call a professional technician. The hidden complexities of these types of systems make them downright dangerous to handle. Contact our experts at Garage Door Repair Irvine to get the best solutions for all of your problems.